The design team at ACF had the wonderful opportunity to attend the Front End Design Conference in St. Petersburg Florida a few weeks ago. Among the amazing, inspirational presenters was Larissa Meek, who did a fantastic presentation on brainstorming techniques. Although her presentation was geared towards front end design, her techniques for brainstorming could be used for any business. Brainstorming lets you generate a large number of ideas to help you find the best solution to a problem. It is most effective when you think about all the possible solutions to your problem, no matter how off the wall they might seem! During the brainstorming process, anything goes! The more ideas you have, the better. The goal is to refine those ideas into one concept that will work best to solve your problem. There are several different techniques used to brainstorm that can help you get a clear, focused solution to a problem. Below are a few techniques Larissa recommends. Remember that these techniques are just ways to help generate ideas. The ideas you generate from brainstorming won’t necessarily be the final solution to your problem, but they can help you along your way. This is a great group brainstorming activity because it allows everyone to have a chance to share their ideas. Start with a piece of paper and fold it into 4 squares. Label each box made A, B, C and D.
Right an off the wall idea in box A. Pass the paper to the right. The next person will refine the idea in box A with their own idea and pass it to the right. Repeat the process until box D. You will then have an idea that you can work with and continue to refine to an executable solution. 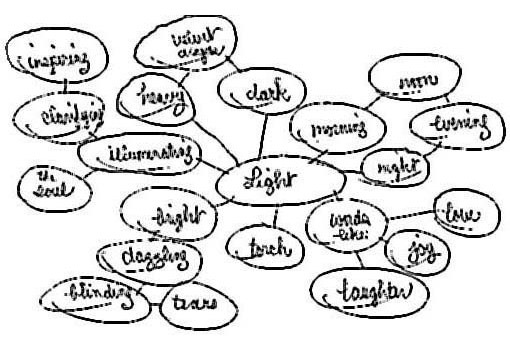 Clustering is a great technique because it allows you to group similar thoughts or ideas together. It can be done by yourself or in a group setting and can really allow the ideas to flow. Start with one central idea and write that word down on the center of a piece of paper. Next, draw lines connecting the words revealing patterns. Mind mapping is similar to clustering. 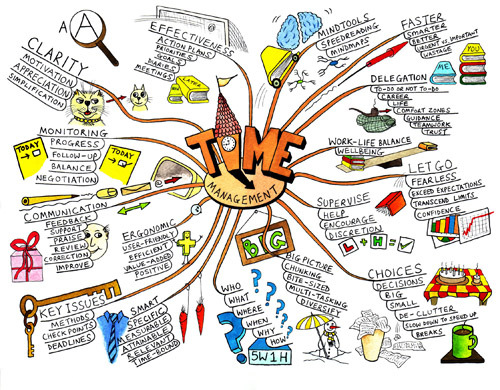 Mind maps are diagrams used to represent ideas linked to a central idea. You can get more detailed with mind maps, drawing pictures or coloring each branch of the map a different color. This is another technique that can be used alone or within a group setting. Mind mapping often works well after doing a clustering activity. Take your best ideas from clustering and expand on them through a mind map. When you get a great idea, ask yourself the above questions and you will see how the idea can change. This is another great way to do group brainstorming because members of your group may think of things that you would have never thought of. As Larissa said in her presentation, “great ideas take experience, practice and hard work.” Brainstorming activities can help focus your ideas into clear concepts. Try these activities with your team and let the creative juices flow!